An afternoon with lunch, meeting fellow alumni and a fun day at the track. Please join us as we visit Tampa Bay Downs and enjoy a day at the races, lunch, meeting with fellow alumni and recent Harvard Admits and their family. The day honors our departed friend Bronson Thayer. 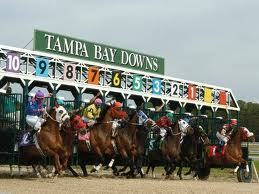 Stella Thayer kindly invited the Harvard Club to again arrange this event at Tampa Bay Downs. $0 for New Admits and Their Families through April 1. $10 for new Admits and Their Families. 10:30-11:00am: A Harvard Club Officer will be standing near the Clubhouse Gate (south end of the clubhouse) and will provide you with your tickets to enter. After 11:00am: Tickets will be left at the Clubhouse Gate. Tell the person at the gate your name and they will hand you your tickets to enter.